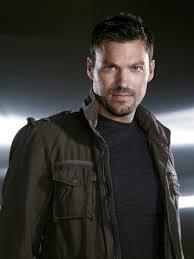 We’re not fans of Terminator Sarah Connor Chronicles – but we were fans of Derek Reese. He was the best male character in the series, a fine actor and just fun to watch. Derek Reese, brother of Kyle, uncle to John is Dead. He literally walked into the gun of a Terminator who shot him in the head dead. Quick, sudden and brutal. There was little lament, little grief..
After all the big thing in this episode was the CAPTURE OF SARAH CONNOR! Yes this show often moves to slow, but now wow…alot of activity in a very short period of time. Can this show survive without Derek Reese? Sure..but it won’t be as good. the only character this show could not survive without is Cameron (Summer Glau) beyond that they can all get shot …well i suppose John Conner the weenie is supposed to survive but he’s so lame we still keep hoping he gets toasted too.